This is another amazing book by Shelly Peterson. She wrote another page turning mystery that cannot be beat. It is 268 pages long and it was so good I read it in a day. I hope you decide to pick up this novel because it is a decision you won't regret. 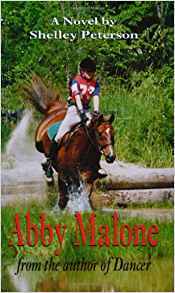 Abby Malone sits at her desk in a sweltering classroom in June and daydreams about the beautiful mare across the road. Before we know it, she's out the window, `borrowing' the mare and rounding up the neighbour's escaped cows, adding another black mark to her record of bad behaviour at school. Things are not easy at home: an alcoholic mother and an incarcerated father add to her ever-present fear of eviction, yet Abby doggedly tries to make the best of every situation. `All my problems are with humans,' she tells her raccoons. But not all humans are bad; Pete and Laura Pierson, the elderly farm couple who live beside the school, give her assistance, encouragement and support while Abby tackles a mystery, falls in love, and competes in a perilous steeplechase. This is a fast-paced story that takes the reader on an unforgettable journey of heartache and personal triumph. Return to Share Your Favorite Horse Books!.